Mini Album Archives - Page 6 of 9 - Pebbles, Inc.
Hello Pebbles friends! 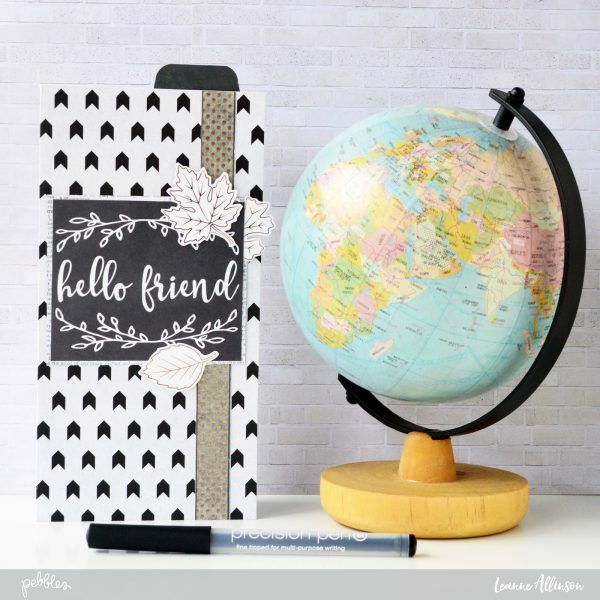 It’s Leanne here today, sharing with you an easy DIY Travel Planner! I wanted to create this gift for one of my friends who aspires to travel and take notes of her journeys along the way. She normally doesn’t have a lot of space to take bulky items with her, so I made a slim line planner note book, easily able to fit in an over the shoulder bag, so she can pen in her details as she travels. Not only is this a gift that will be fully appreciated, it will also help with organizing her travel needs. 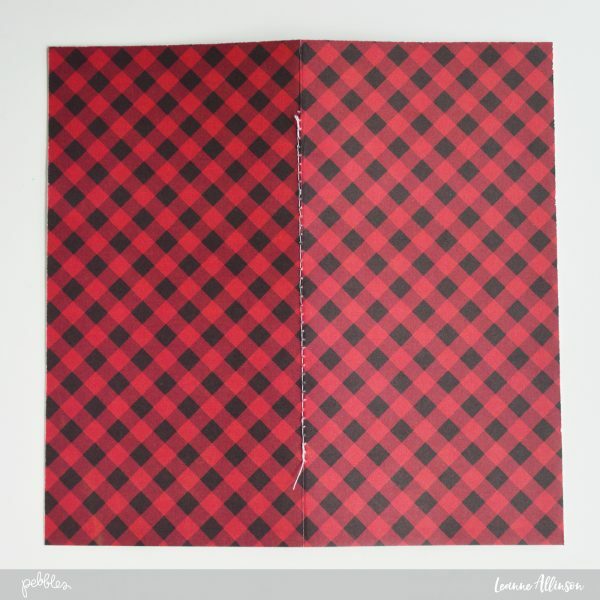 To create the cover, start by trimming to size (8×8) your favourite piece of patterned paper. I have used Warm & Cozy Log Cabin. Score a fold line down the center and add details to embellish. I’ve fussy cut leaves from the Rose Gold Foil cardstock and layered them between pieces of patterned paper. I’ve chosen the Cozy Sentiment cut apart to use as a title instead of thickers. 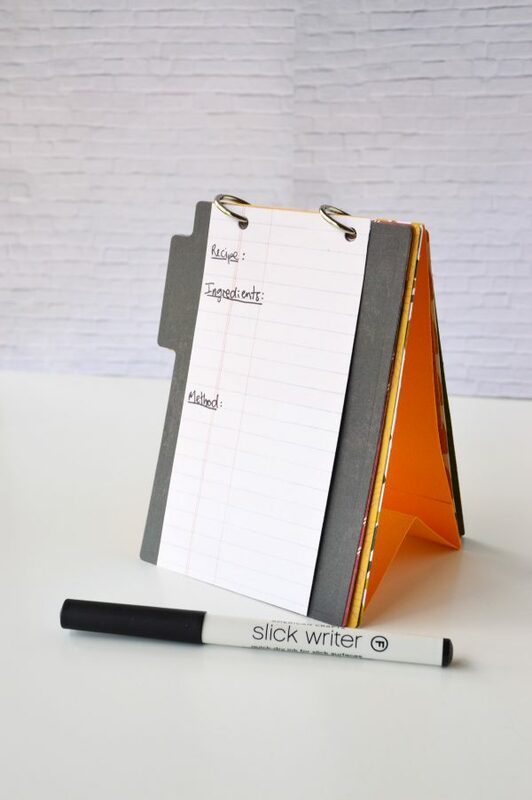 This will help keep the travel planner as slim lined as possible. 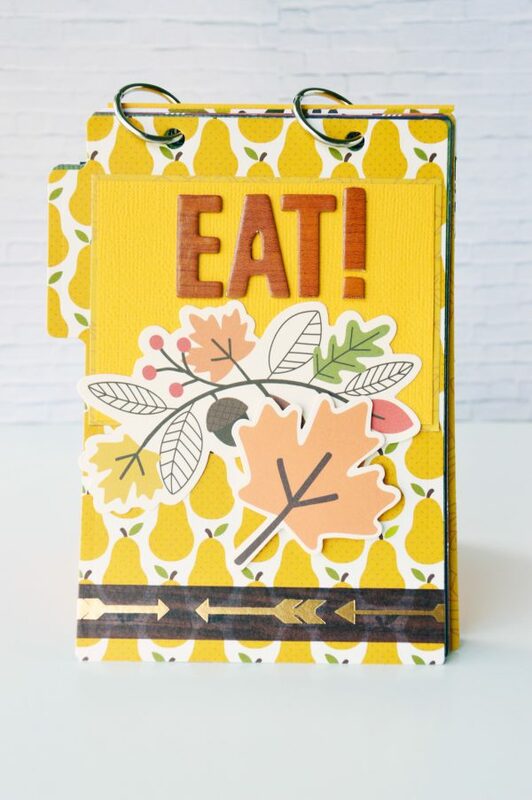 The gold dot washi tape complements the gold foil fussy cut leaves and anchors the embellishments to the base patterned paper. For the insert I have trimmed several sheets of copy/printer paper to fit the inner patterned paper liner. score a line down the center of each piece. 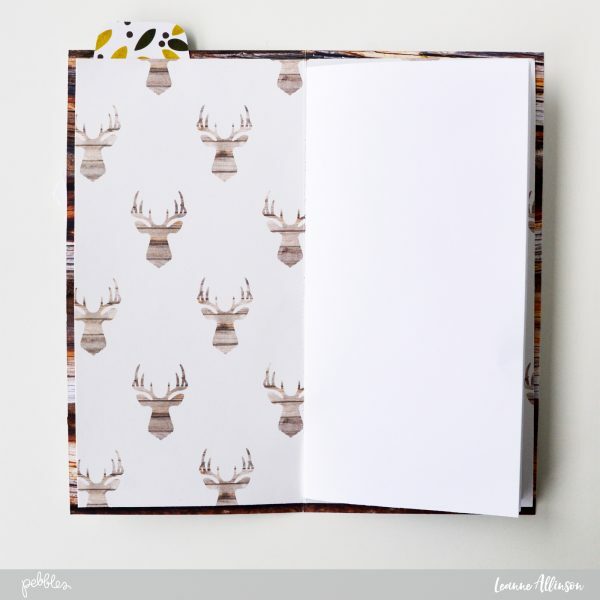 For the patterned paper I have used Warm & Cozy Antlers, trimmed to 7.75″x7.75″ and also scored at the halfway point to allow it to fold flat inside the cover. To attach the copy paper to the inner patterned paper piece, machine stitch along the fold line. 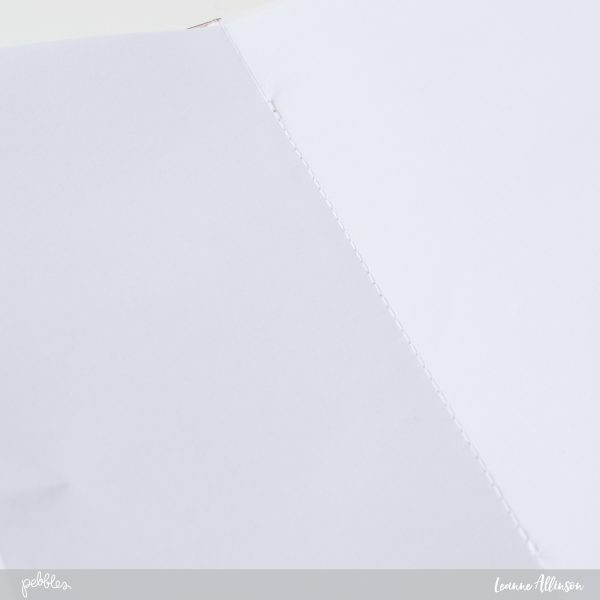 Create a tab paper piece and adhere to the inside of the cover. Now add adhesive to the insert and carefully align the insert fold line with the fold line of the cover. 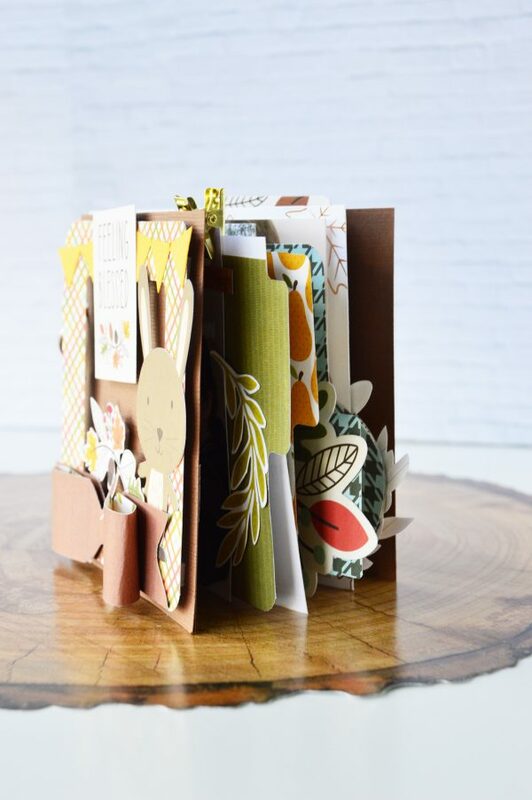 Press together carefully one side at a time – front cover to front insert, fold over then adhere back insert to back cover. 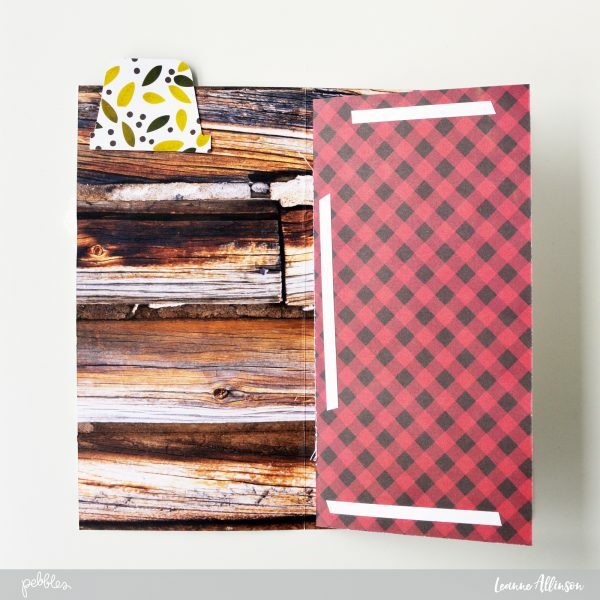 Create your own Recipe File Folder mini album! Hello Friends! 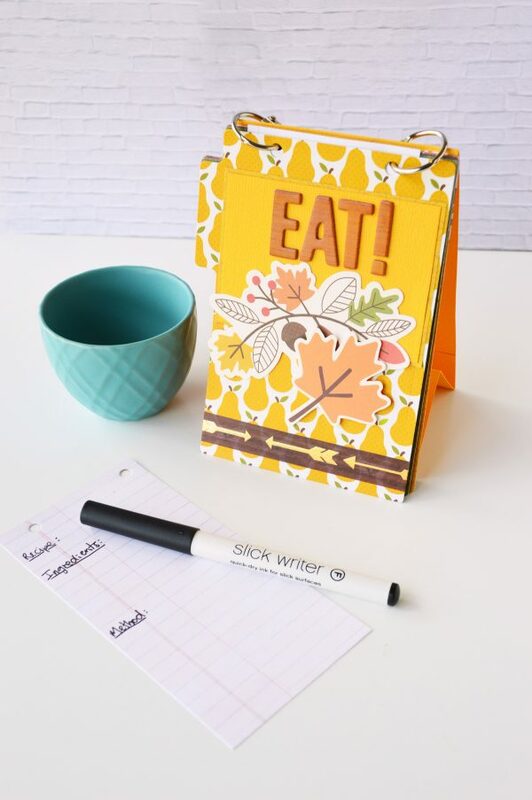 It’s Leanne here today sharing an easy Recipe File Folder mini album that will keep all your favourite family recipes together in one place! This project is also perfect to create as a gift for those who love cooking or are just starting out as a beginner chef! 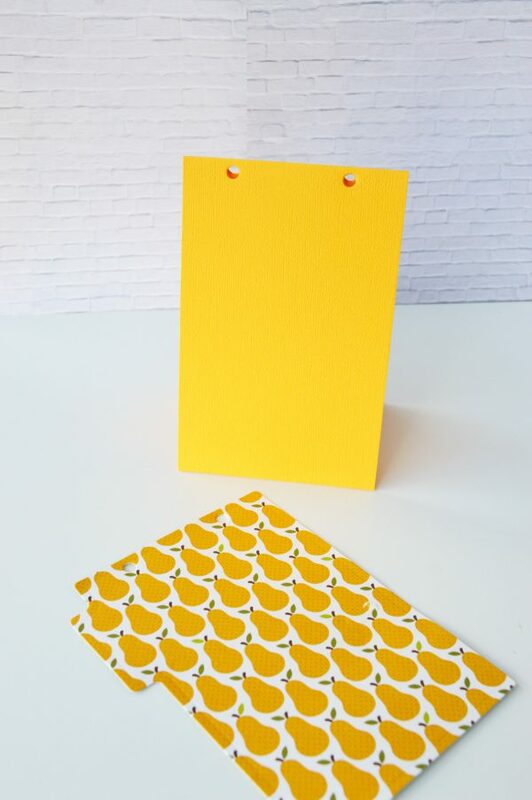 To create this stand alone file folder you will need some sturdy cardstock as your base and your favourite Pebbles Inc paper collection. 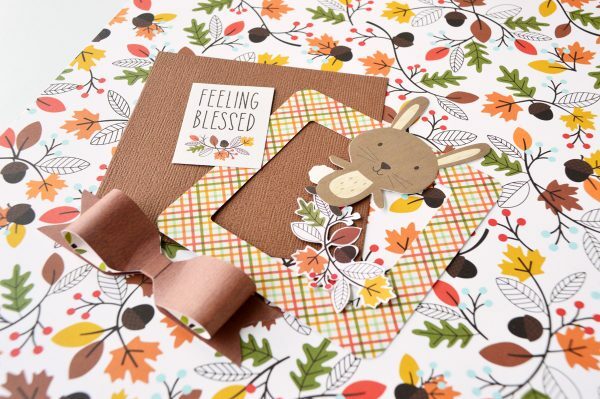 I am using the new Woodland Forest and Warm & Cozy collections. Let’s get started! 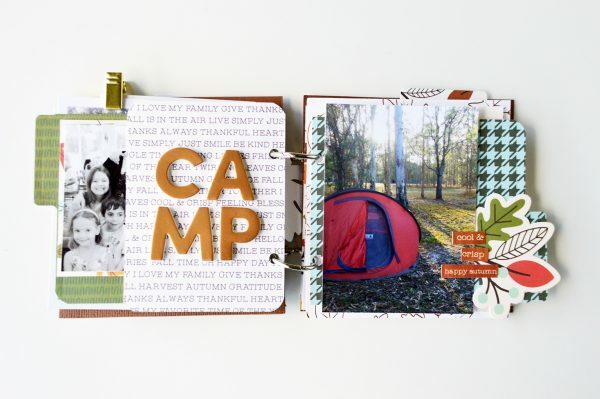 Other supplies will include two small jump rings and the Pebbles Inc Harvest Dies: Tab & Recipe Card. 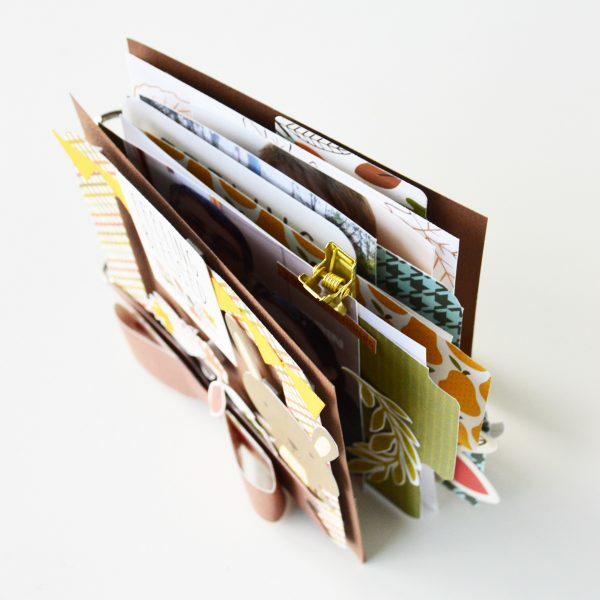 Trim several pieces of patterned paper with the metal die and two pieces of coordinating cardstock to 12”x4”. note: When cutting the patterned paper using the metal die, be aware of the positioning of the pattern on the paper. I have kept all the tabs on the top left side for cohesion. This is simply a personal preference. Take one of the cardstock pieces and cut in half (4”x6”). Score a fold line at the 1”, 3” and 5” points. Fold to create peaks and valleys – a concertina fold. On the second piece of 12”x4” cardstock, score and fold a line at 6”. 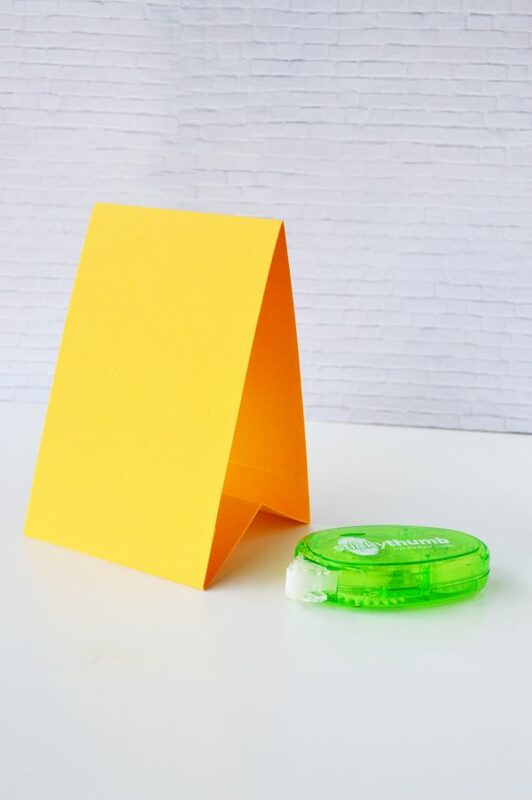 Add adhesive to the 1” areas on the smaller piece of cardstock and attach to the inside of the taller 12”x6” piece. Punch holes in the top of the cardstock stand at the 1” and 3” marks. Do the same with the file folder recipe cards. 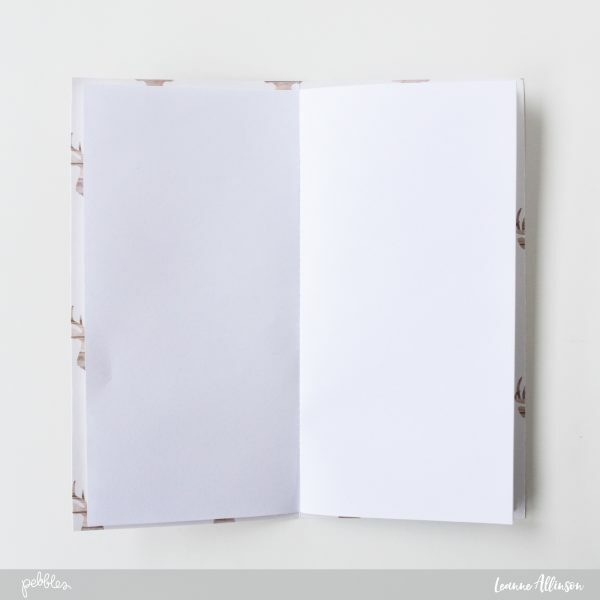 Add some inserts for writing down recipes from ledger patterned paper. 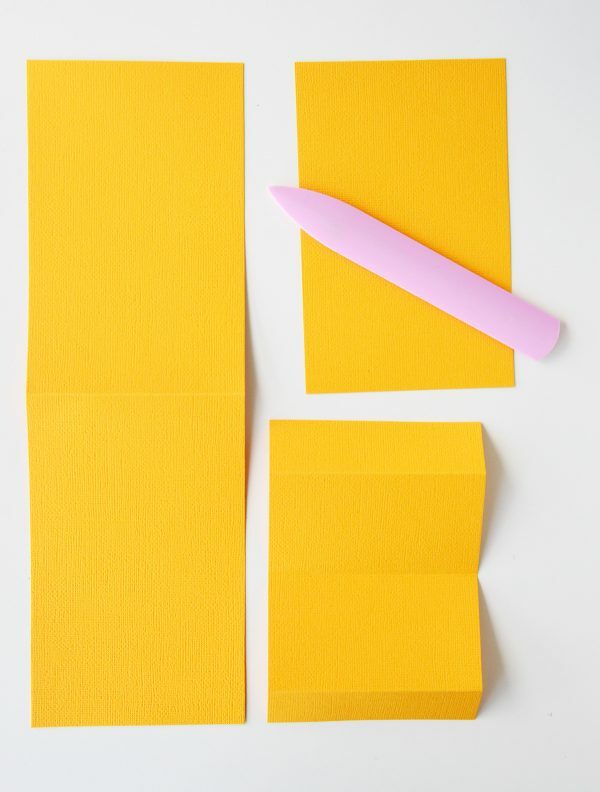 Trim the paper to 3”x6” in size. 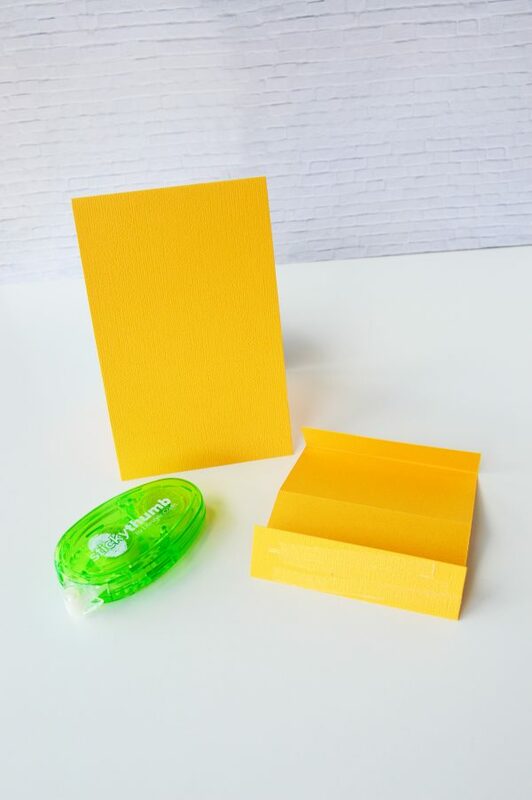 Secure all of the paper pieces to the cardstock base with jump rings. 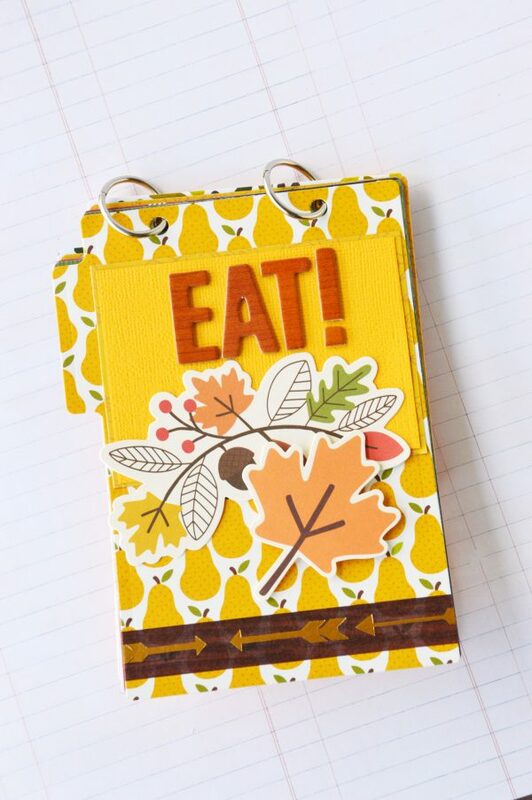 Embellish your front cover and add the word “EAT!” using the Woodland Forest Alpha Thickers. Now all you have to do is fill this mini with all your favourite recipe dishes. Thanks for visiting. Hi everyone. 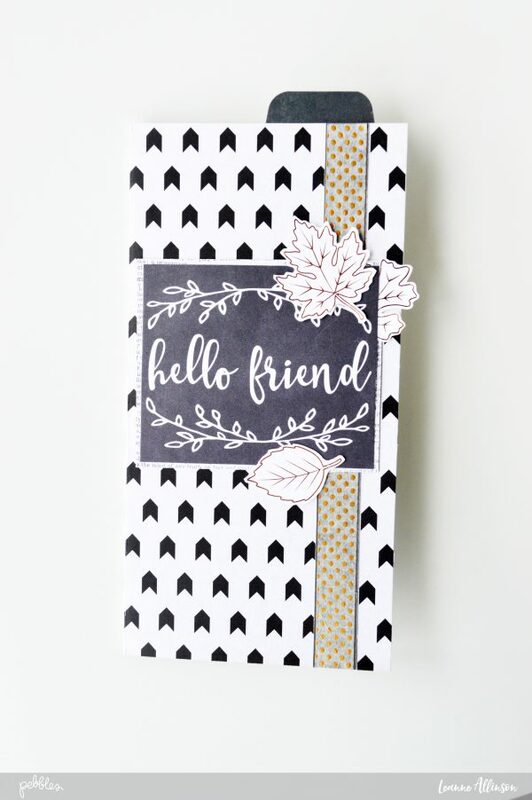 Heather Leopard is here today talking about quick journaling gifts. My daughter’s birthday is in 3 weeks and it’s a BIG milestone birthday. 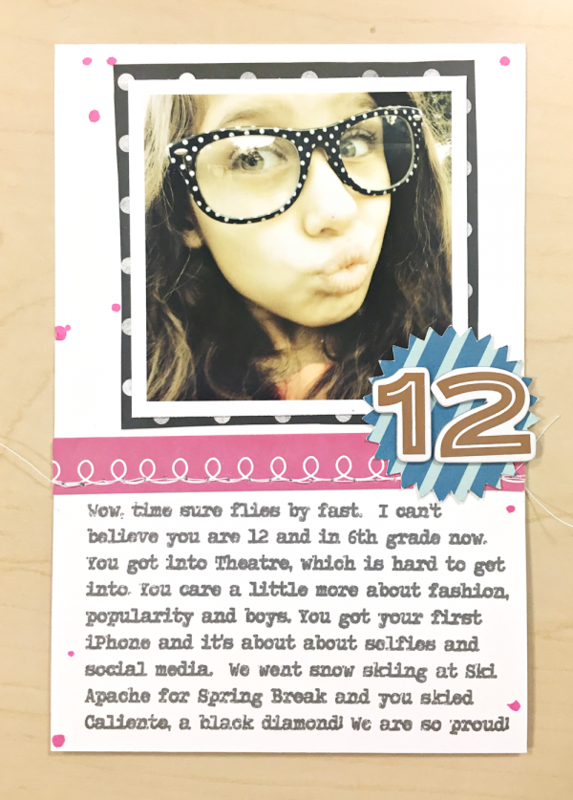 She’ll officially be a teenager! Since this is such a momentous occasion, I thought it would be nice make her a birthday mini album and write 1 note to her for every year with the plan for her to read one every day leading up to her big day. I wanted this to be something that can be made relatively quickly and can be scaled up or down depending on the number of years the birthday recipient is turning. Afterall, if you choose to make something similar for a 30th birthday, you don’t want it to take too 30 years. 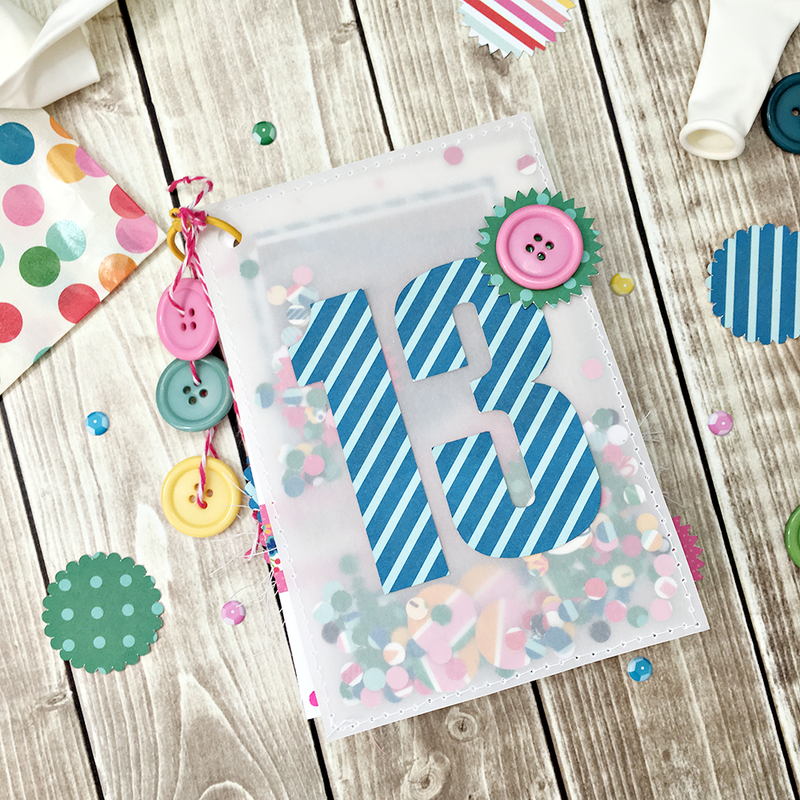 Since I wanted it to be quick and easy, I chose to keep the embellishments and details to a minimum, plus I wanted this birthday mini album to have plenty of space for a favorite photo and journaling highlights from each year. 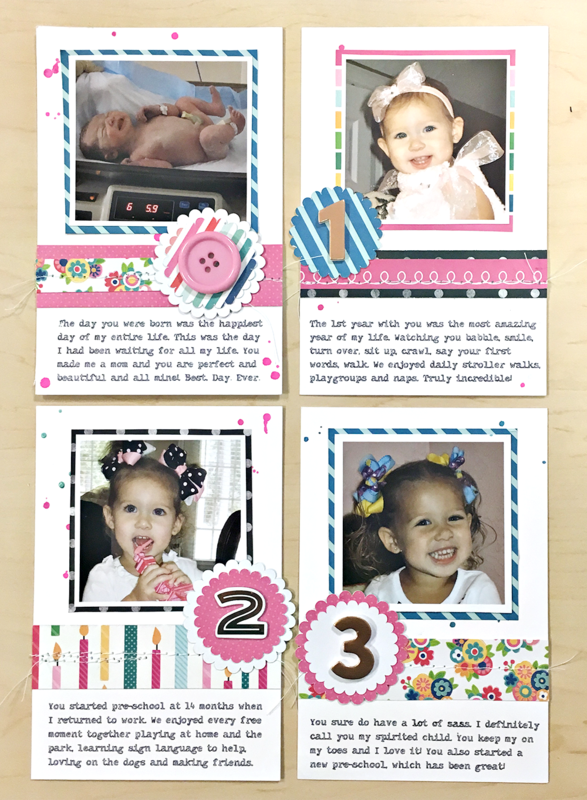 This birthday mini album will have a finished size of 4×6″ so your first step will be to trim your cardstock to 4×6″. 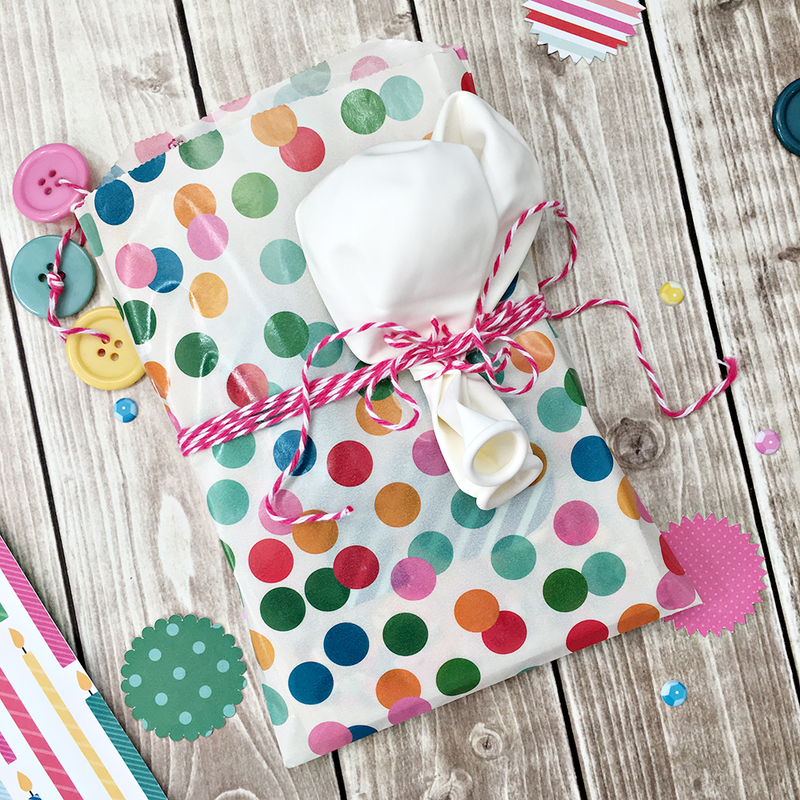 Be sure to cut a cover and enough pages for all the years you are celebrating. 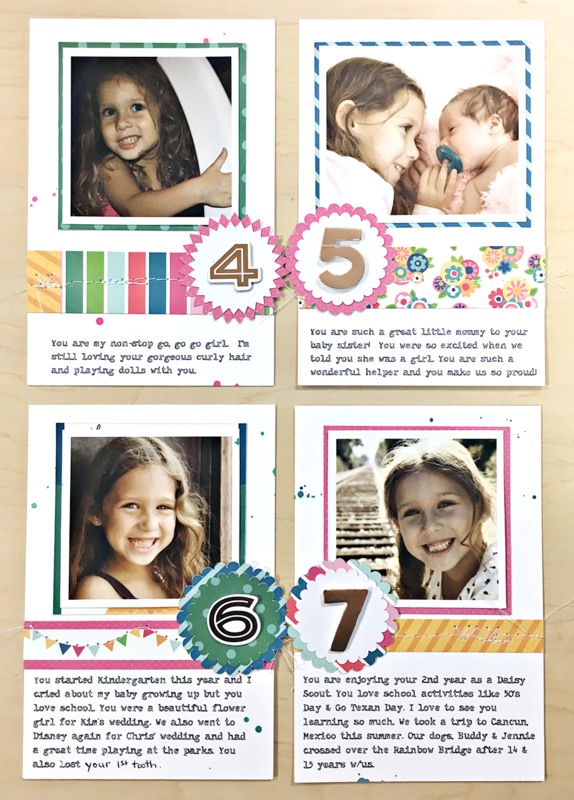 Choose your favorite photos from each year and print them no larger than 2.5×2.5″. Add them to your pages if you are handwriting your journaling. If you are typing or using your CAMEO sketch pens, you’ll want to do the journaling before you add the photos. 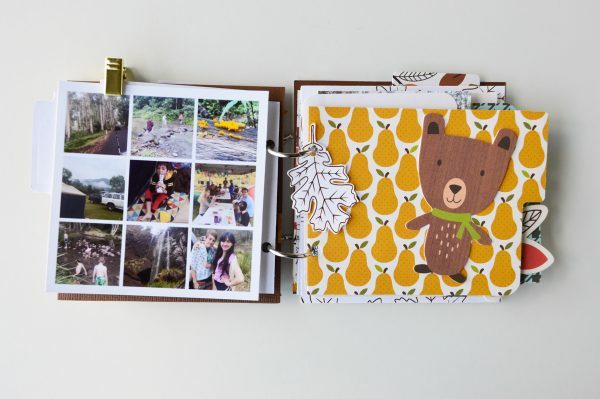 Next, add your journaling to the pages. You can choose to keep everything consistent from page to page or mix it and journal in different spots. 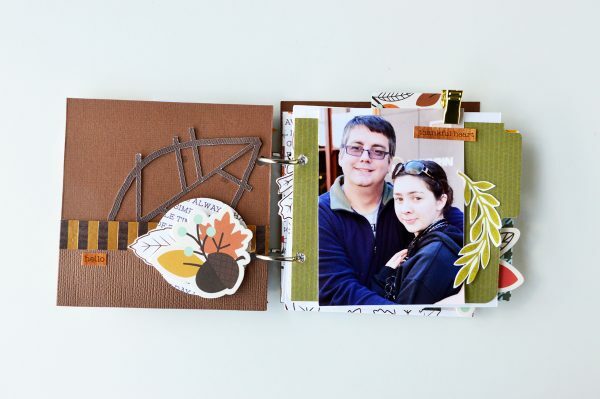 Make sure to leave enough space for your photos if you are adding the photos after your journaling. Lastly, add embellishments. I chose to keep it simple by adding a few strips of paper, punched circle and the year. I stitched these elements to each page to make sure they were nice and secure. You may choose to wrap each day’s page separately so that she opens a new one each day. Make sure to include a book ring so the birthday girl or boy can piece them together each day to build their birthday mini album. Hello new Pebbles friends. Heather Leopard here today with my first project as a new Pebbles Design Team gal. I’m super excited to show you a quick gift I made to give to my girls. 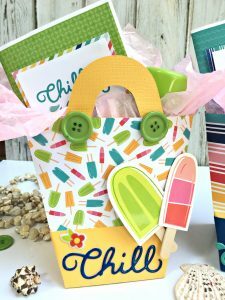 We love our beach vacations and I thought it would be fun to give my girls a little care package to document all our summer activities. The creative aspect of this care package includes the gift bag and mini album / journal. 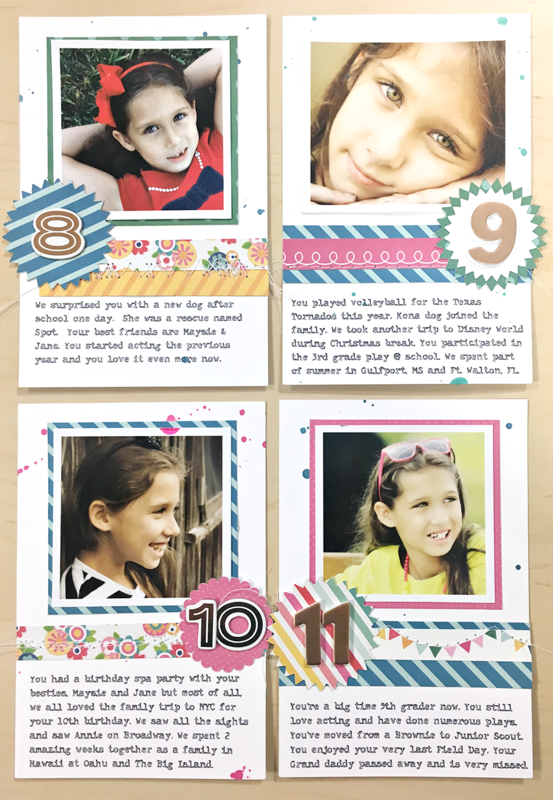 These are relatively easy to make if you have a die cut machine or template you can follow. 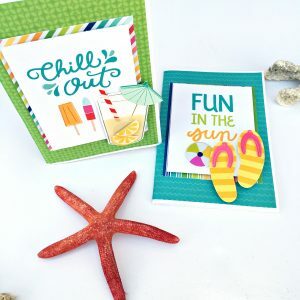 The Fun in the Sun collection is perfect for this project. To get started, I knew I needed to begin with the beach bags. The bags needed to be able to hold the album and other little goodies so I made it fairly large, measuring at 6″ x 8″. Choosing a design that allowed for a 2 tone pattern gave it added interest. Then it was time for the really fun part – decorating! 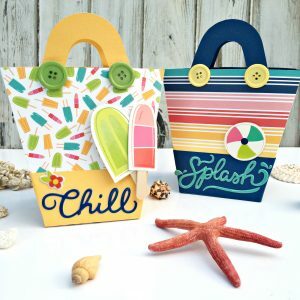 Each bag includes buttons where the straps attach to the bag, a fun sentiment and a coordinating embellishment or two. You could also hang a tag off one of the straps but I am letting my girls decide which ones they want. Of course, I designed these with my girls’ style and colors in mind so we’ll see how it goes. I designed the mini albums to be 4″ x 6″ to easily fit into the 6″ x 8″ beach gift bags. 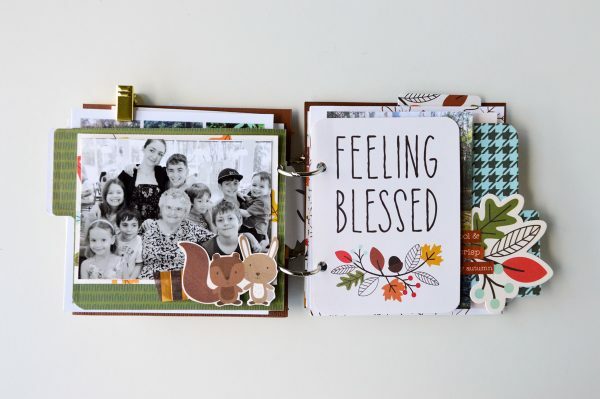 To create these, simply cut a 8″ x 6″ cover and several inside sheets measuring 3.5″ x 5.5″. I used 5 sheets for the inside to make 10 pages. Center the inside sheets so that there is an 1/4″ border. Then I stitched it together in the center. Once the mini album is together, it’s time to decorate again! I added a tone on tone background to cover the album and then I used the fun sentiments from the 3″ x 4″ cards pattern paper, framed it out and then added a dimensional sticker. I can’t wait to give these to my girls. 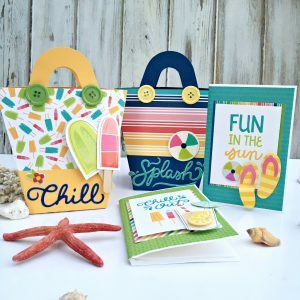 We’re taking a road trip soon so I may even print out a few photos from the summer and put a little craft kit together to keep them busy on our way to the beach.